Order! Order! The importance of questionnaire structure. 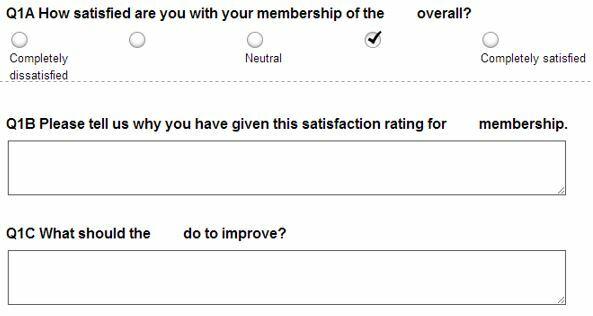 An industry body that I am a member of recently sent me their annual survey. The questionnaire covers topics such as they type of work you do and how you see the future of your business as well as asking for ratings of different aspects of the group’s offerings and any suggestions you have as to how the activities of the group could be improved. When I initially looked at this page I answered the first question and then read the 2 open-ended questions. I found them very difficult to answer off the top of my head. So difficult in fact that I closed the survey and did something else. A week or so later I received a well written reminder to complete the survey. I entered the survey again and progressed to the next page without answering those open-ended questions. The rest of the questionnaire was well designed and easy to complete. If the open-ended questions had been asked later, I would have been much more likely to answer them. In themselves there is nothing wrong with the open-ended questions. I would probably leave more space for typing in answers but the wording is OK. However, open-ended questions tend to require more thought and effort than other question types and take more time to answer. In this case the subject matter wasn’t something I thought about or discussed regularly. I couldn’t just answer the questions in detail, I needed to be warmed up. Survey designers often use the funnel approach when deciding question order. More general, easy to answer questions are presented first. Respondents aren't then put off by difficult to answer questions and they are prompted to start thinking about the survey topic. Questions that require more thought and are more specific can then be placed towards the end of the questionnaire when respondents have warmed up. The quality of response will be better and respondents less likely to drop out of the survey. Before starting to design individual questions it is often useful to draw up a flow chart of the different subject areas you want to cover. You can use these subject areas as building blocks to decide on question order, placing more straightforward, non-challenging topics first and difficult or sensitive subjects later. Open-ended questions seem easy to answer but they really aren’t. I usually skip them if they aren’t mandatory.